Archbold is back and better than ever. It’s the same tried, tested and trusted content. But this year it’s different. The 2019 edition has been reviewed, revised and restructured. Significant improvements have been made throughout by our expanded team of contributors and our new General Editor. And it’s as up to date and authoritative as ever. What’s more, it’s available at the same price as last year. Archbold 2019 – setting a new benchmark for the criminal bench. 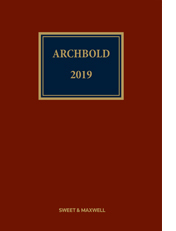 The Ministry of Justice has confirmed that each courtroom will additionally be provided with a copy of Archbold 2019 for the forthcoming legal year. It will enable a review of both court books for the criminal courts to be carried out.